These pegs are very light and very tough. At 8 inches long (about 20cm) they can go deep enough into pretty much any ground and hold your guy lines taut. They are very tough and can take a fair amount of punishment. These pegs are very light and very tough. Being hand made, they are not all exactly the same. They average 8 inches long (about 20cm) they can go deep enough into pretty much any ground and hold your guy lines taut. They weigh between 13g and 20g each and are really very strong. There are two grooves cut around the top of each peg. 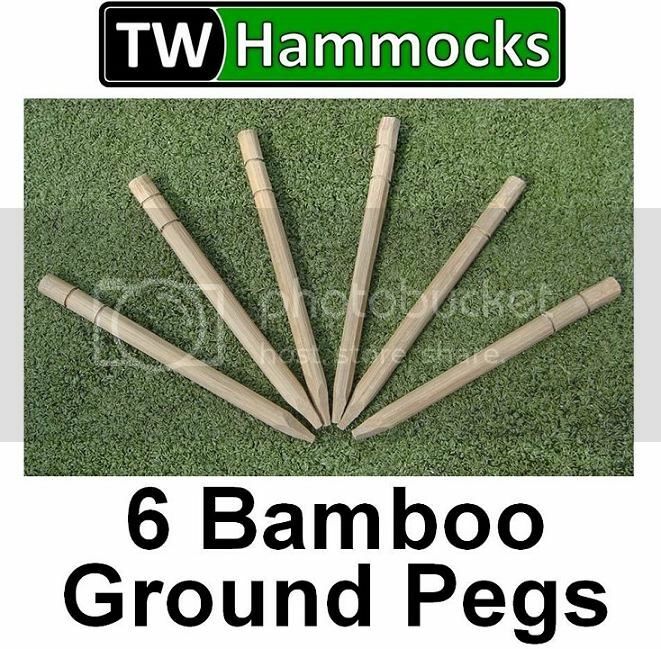 Why bamboo and why hand made? We think about how things are made and their impact on life, not just the environment but also the people involved. So a factory churning out cheap metal pegs uses lots of energy, probably pollutes and must be a soul destroying place to work. So we do our little bit and pay a man who works for himself making wood items. Bamboo is a fast-growing plant and this helps those who work growing it. And they are of course, really solid ground pegs.